On my January 2014 trip to Lake Mattamuskeet, I took time to explore the rural areas around the lake. I took these pictures in Hyde, Tyrell, Washington, Chowan, and Martin Counties. I will publish the Lake Mattamuskeet pictures in an album entitled Lake Mattamuskeet 2014. These pictures try to capture life in the rural, flat plains that lie between the populated, prosperous Piedmont and the tourist towns on the Outer Banks of North Carolina. Abandoned houses and weather-beaten trees punctuate the flat, seemingly endless farmland. The trees provide a vertical dimension in an otherwise horizontal world. The houses and barns stand as empty reminders of the family farms that once thrived here, only to fall victims to industrial farming. Small towns and communities with vacant stores and houses dot the landscape, struggling to survive in the new economy. But, even here, along with the sadness for times gone by, there is beauty. 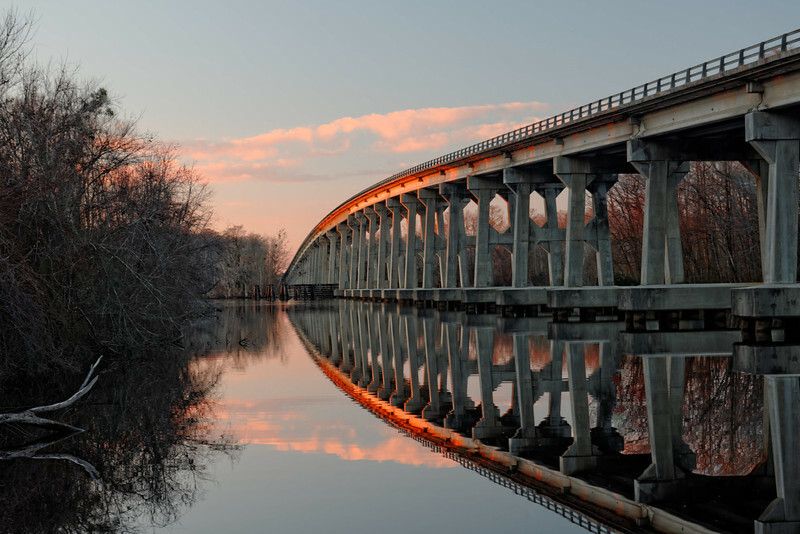 Zeb Vance Bridge over the Roanoke River at Sunset. Part of the Inner Banks Scenic Parkway.